OPC 42.5N is the most commonly used cement on the market today. 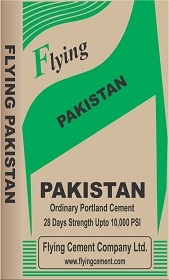 We Flying Cement Company Limited have over the years, mastered the art of manufacturing OPC 42.5, which achieves the required strength quickly. Applications which require high strength quickly after pouring, OPC 42.5 N is the recommended type of cement for general applications. Extensive sampling and testing during the manufacturing process ensures the consistency and quality of the end product. CRDI [Cement Research & Development Institute, Pakistan. SGS [Societe Generale De Surveillance], Switzerland. 1-Sarwar Colony, Sarwar Road, Lahore Cantt 54600 - Pakistan. � 2019, | All rights reserved.